"At the time of analysis, this threat downloads and install a key stroke logger which we detect as Win32/Spy.Agent.NSO trojan. The server used to deliver the components used in this attack is presently located in the US, but the IP is assigned to a customer in China. " ISP: GSN, Taiwan Government Service Network. Incoming mail for oltnsck.dnsrd.com is handled by one mail server at dnsrd.com. Oltnsck.dnsrd.com has one IP number (120.126.34.94) , but the reverse is ymu034-094.ym.edu.tw. Ymu034-094.ym.edu.tw point to the same IP. Oltnsck.dnsrd.com use this as a mail server. Dnsrd.com is a domain controlled by three name servers at changeip.org. Two of them are on the same IP network. The primary name server is ns3.changeip.org. Incoming mail for dnsrd.com is handled by one mail server at changeip.com. Dnsrd.com has one IP number (204.16.173.30). 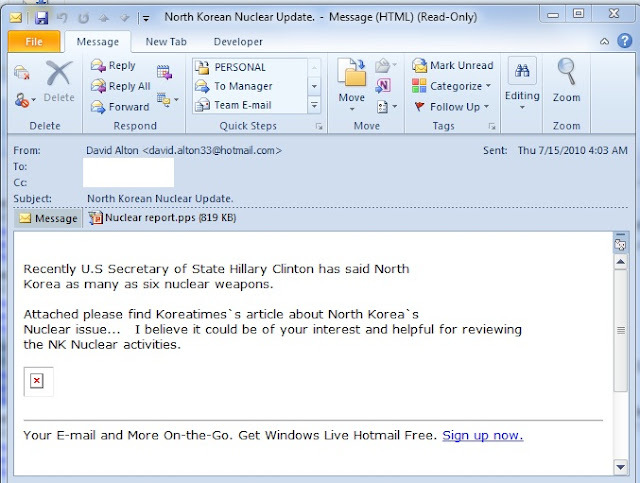 Subject: North Korean Nuclear Update. Korea as many as six nuclear weapons. Organization: City Telecom (H.K.) Ltd.
Microsoft Security Advisory (2286198) Microsoft is investigating reports of limited, targeted attacks exploiting a vulnerability in Windows Shell, a component of Microsoft Windows. This advisory contains information about which versions of Windows are vulnerable as well as workarounds and mitigations for this issue. The vulnerability exists because Windows incorrectly parses shortcuts in such a way that malicious code may be executed when the user clicks the displayed icon of a specially crafted shortcut. This vulnerability is most likely to be exploited through removable drives. For systems that have AutoPlay disabled, customers would need to manually browse to the root folder of the removable disk in order for the vulnerability to be exploited. For Windows 7 systems, AutoPlay functionality for removable disks is automatically disabled. Trojan:WinNT/Stuxnet.A is a trojan component installed by TrojanDropper:Win32/Stuxnet.A that injects code into the running process LSASS.EXE. Note: refers to a variable location that is determined by the malware by querying the Operating System. The default installation location for the System folder for Windows 2000 and NT is C:\Winnt\System32; and for XP, Vista, and 7 is C:\Windows\System32. These days I see a spike in the number of searches for WIAM.EXE, which is listed as one of the file available for download upon request. I thought I would add a few more details on this file and files associated with it. While there can be any kind of file named wiam.exe, chances are that your file is similar or identical to the one described below. This file is part malware kind frequently referred to as APT malware. If you find this file on a system, look for others listed below. And yes, as you already guessed, you have a Problem. "The Advanced Persistent Threat (APT) is a sophisticated and organized cyber attack to access and steal information from compromised computers. The intruders responsible for the APT attacks target the Defense Industrial Base (DIB), financial industry, manufacturing industry, and research industry. The attacks used by the APT intruders are not very different from any other intruder. The main differentiator is the APT intruder’s perseverance and resources. They have malicious code (malware) that circumvents common safeguards such as anti-virus and they tend to generate more activity than wanton “drive by hacks” on the Internet. The intruders also escalate their tools and techniques as a victim firm’s capability to respond improves. Therefore, the APT attacks present different challenges than addressing common computer security breaches." The file itself is not really a trojan but a cli tool, part of the modified pass-the-hash toolkit (PSH toolkit) released by Core Technologies. You can compare them in a hex editor, the files are not identical but here are similarities in the strings. If your attackers are sloppy or if you run data recovery/unerase/unformat tools on the affected machine, you may find other tools and files associated with this type of attack. PWDumpX v1.4 - Dumps domain password cache, LSA secrets, password hashes, and password history hashes. m.exe is a file you may find together with the files listed. This file might be a standalone creation or a derivative of getmail (many thanks to JM for the tip). See the strings below for comparison. One needs to specify user name, server name, date range and location where to save the stolen data. The email messages will be converted to text and attachments saved in corresponding subfolders. See examples below. Thanks so much but I will not be able to attend the meeting. Jon, can you join us for the meeting tomorrow? 5. Batch files to automate the process. 6. Backdoor services and files for their installation. - there are MANY types of services that get modified to serve as backdoors by replacing the legitimate library. I posted a few recent examples before and and I will post more but now I will give one example. "Description"="Enables authentication,authorization and accounting of dial-up and VPN users.IAS support the RADIVS protocol"
Other example of a backdoor file, which does not run as a service. It runs as a separate process and with the same name ccapp.exe, which is a name of Symantec/Norton Antivirus’ real-time scanner. There can be a few other files as well, this is a basic pack that is needed to pull it off. I will be adding more files related to this type of attack and other APT malware but feel free to email me if you have questions or comments.